'Scoodie' comes from the combination of the words scarf and hoodie and it is taking the world by storm! Magdalena Melzer and Anne Thiemeyer have created 20 scoodie designs that are not only fabulous fashion accessories, but their chunky crocheted yarns will keep both your neck and head wonderfully warm and cosy. The projects range from the classy and chic to the more casual and creative. With so much variety to choose from, you're sure to find the right style to suit you. There are only two sizes of crochet hook required for every design in the book; and all the projects are graded by difficulty, meaning that, no matter what your crochet ability is, there really is something for everyone. There is even a helpful step-by-step basic crochet guide and techniques for making pom-poms and tassels. 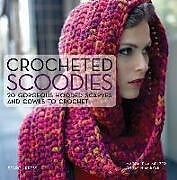 20 gorgeous hooded scarves and cowls to crochet.